Have you ever eaten something that made you remember a time long gone? When I was a kid, I remember going to the houses of my grandma, Hazel, and great aunt, Evelyn. Whenever I’d go to my grandma’s place, I’d get a small, orange jar of marinated carrots out of her fridge and devour them almost all in one sitting. I’ve never had something like this before—like a cross between pickling and marinating—with a tomato base, but with vinegar, oil and seasonings added to it. Although my grandma and great aunt have both passed away, this recipe is one of those ways I can remember the times of visiting them. Since I’ve never seen this recipe in a store-bought version, I thought I’d share it with you. 1 can of tomato soup, 10 ¾ oz. 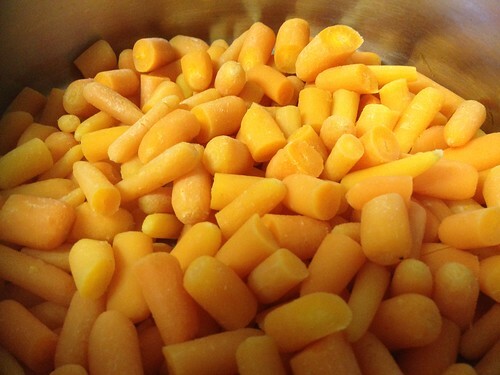 Cook carrots to the point where they’re soft, but just have a bit of snap to them. 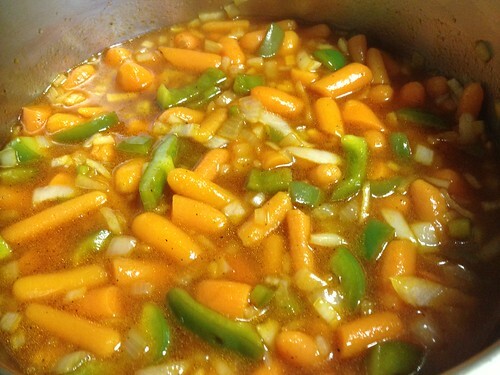 While cooking the carrots, combine bell pepper, onion, and all of the other ingredients in a medium pot. Bring the sauce to a boil and then pour over the carrots. 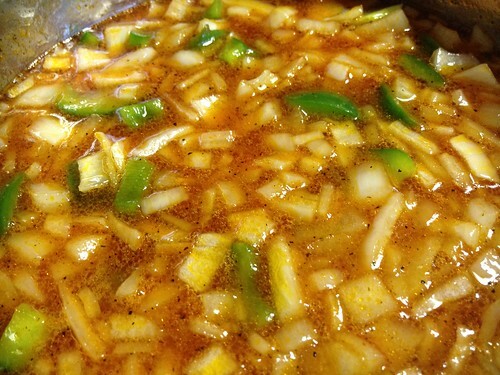 Marinate for at least 12 hours and keep indefinitely in the refrigerator. I have a dessert recipe of my great aunt’s that I will post in the next week after I make it, so keep your eyes peeled for this yummy goodness. I hope you enjoy this recipe! Do you have any recipes that remind you of times long lost? Do you and your partner have a special song? This was a question I placed for one of my clients today and it made me start thinking of a song for Yaicha and I. At the same time, I stumbled upon a greatest hits album called “Eggs Are Funny” on Spotify for a prog-rock band called Mew. Mew was one of the first ways that we met, when she came in to my work at the CD/Game Exchange to special order a couple Mew CDs. Years later, I’d take her to see Mew for the second time at the Hawthorne Theater and I’d be blown away with their live performance. So, while I don’t believe we have a song, I think this is probably our band. I leave you with “The Zookeeper’s Boy” off their 2006 album “And The Glass Handed Kites.” Give it a listen and I’d love to hear what your song or band is.